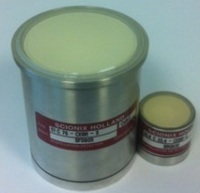 The R&D Detector group is involved in the Working Package 1 of the European GANAS project whose main objectives are the study of the detection properties of new advanced scintillator materials and to assess the performances for its use in a gamma spectrometer having the requested properties like PARIS and/or CALIFA detectors. 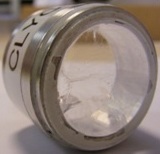 At present, the brightest commercially available scintillator crystal is LaBr3:Ce, featuring an energy resolution better than 3% at 662 keV, and a decay time constant of 16 ns. Anyhow an intensive employment of LaBr3:Ce might suffer because of some disadvantages. In particular, it suffers of intrinsic background, it is highly hygroscopic, and thus requires a proper encapsulation and it cleaves easily. The fragility of LaBr3:Ce results in a still quite challenging growth process, especially for large volumes optics. This effect, in addition to the monopole production, makes this material particularly expensive. In the latest year there is therefore a renewed interest, in the chemistry and material science community, to search for new luminescent inorganic crystals as real alternatives to LaBr3:Ce. While many of the new proposed scintillators are still in the developing process and are not available in sizes suitable for our interest, there are few, as CeBr3 or SrI2:Eu, for example, that have already been grown in cm3 scale samples. The named crystals deserve close attention due to their promising detection features. In particular, CeBr3 provides a light yield of 68 photons/keV and a fast decay time and SrI2:Eu, while being brighter with a light yield close to 100 photon/keV, has a long decay time constant (around 1 µs) and a very linear response. Another field of interest for the proposed study might concern scintillating transparent ceramics. While the production of large optics has already been assessed, this solution results particularly appealing to reduce the production cost, to increase the activator concentration and the uniformity of doping and, as well, to improve the mechanical robustness of the scintillator. It is then our interest to test and characterize such promising new scintillator materials as well as to create a network with expert laboratories and companies that produces them. - CeBr3, providing detection properties close to that of LaBr3:Ce and already available in big volume samples. Two optics purchased from Scionix. - SrI2:Eu, which despite the fact it has a long decay constant is brighter and even more proportional than LaBr3:Ce. 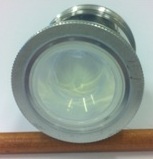 One optic lent from Lawrence Livermore National Laboratory and another one purchased from RMD. - CLYC, which not only can provide an energy resolution better than 4% at 662 keV but has also the ability to detect thermal neutron in a gamma-ray filled environment. One optic purchased from RMD. - GYGAG:Ce, which is quite bright and it is an oxide ceramic, thus offering all the advantages in terms of robustness and chemical stability that a ceramic can offer with respect to a crystal. One optic lent from Lawrence Livermore National Laboratory. 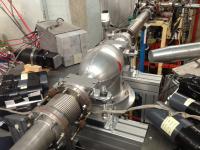 We tested the gamma ray detection features of the procured scintillator in a nuclear experiment in during an in-beam campaign at ALTO in May 2013.